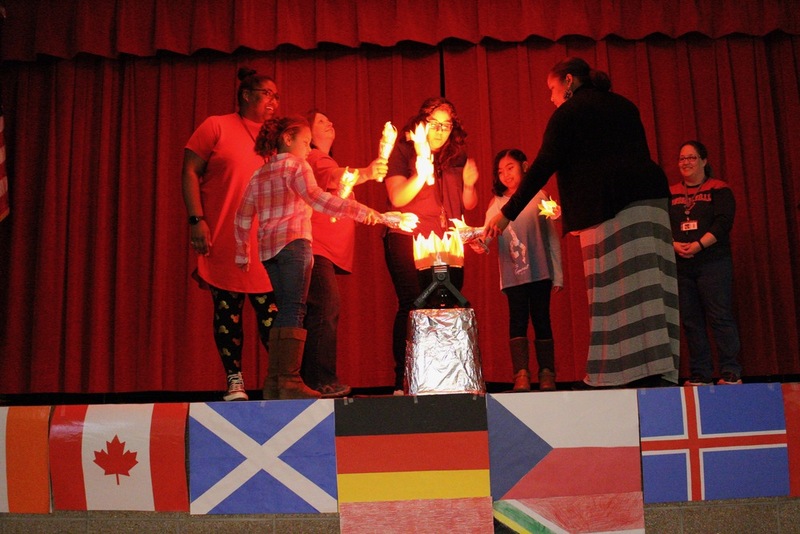 Crawford Elementary School recently held an opening ceremony for the winter Eaglympics 2018. The opening ceremony kicked off with a parade of nations represented by each class and a lighting of the torch. During the opening ceremony, students also learned about the five academic and service activities they will compete in that coincides with the Winter Olympics. The first academic activity is reading, and students have been challenged to read a total of 200 minutes in the classroom and at home. The second activity is math/STEM and will take place in the science lab/classroom. Students in kindergarten will be making the tallest snowman where they talk about structure and function, grades 1-2 will be designing a downhill skier/snowboarder, where they will make their person and board and will see who can go the fastest downhill, and grades 3-4 will be designing bobsleds, where they will use what they have learned about force and energy to design a bobsled to see who will go the fastest on the track. The third activity is community helpers, and the students have chosen to help raise $1,500 as a school for Jump Rope for Heart. For the fourth academic activity, students and their parents will be working on their art skills. Students were given a paper with the Olympic rings to take home and decorate with their family. The family’s art project will then be displayed at the school. The final academic activity is physical activity/health, where each class will schedule a time with the PE teacher to compete in a game. The closing ceremony will be held February 26 at Cyclone Arena, where students will compete in games and classes will be awarded medals for their achievements during the Eaglympics.